Sonnet Thunderbolt Range annonced for Shippment from October 2011. Thunderbolt technology is amazing—the speed (up to 10Gb/s) and versatility (supporting high-resolution displays plus high-performance data devices through a single, compact port) make it clear that this is the next generation I/O technology, available today. But what about connecting existing FireWire, eSATA, and USB 3.0 peripherals as well as high speed memory cards? 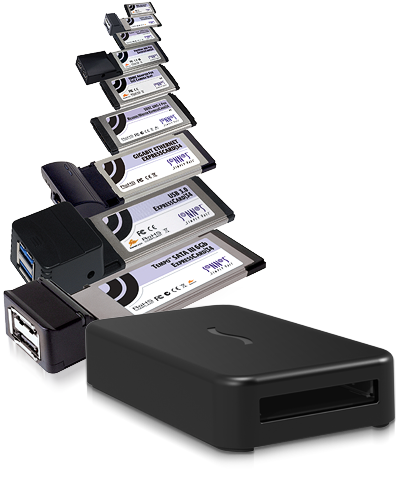 Sonnet’s Echo ExpressCard/34 Thunderbolt Adapter expands Thunderbolt connectivity to support more than just storage systems and monitors. This Sonnet adapter adds an ExpressCard/34 2.0 slot to any computer to which it’s connected, enabling you to use a wide variety of ExpressCard/34 cards to add a wide range of interfaces and capabilities to your system. 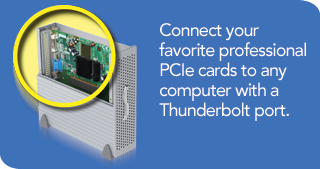 Sonnet's Echo™ Express PCIe 2.0 Expansion Chassis with Thunderbolt™ Ports enable you to connect one high-performance PCI Express® 2.0 adapter card to any computer with a Thunderbolt port. Imagine using full-size professional video capture cards, 8Gb Fibre Channel cards, 10-Gigabit Ethernet cards, and RAID controller cards with your new iMac® or MacBook® Pro. The Echo Express expansion chassis makes it possible! Available in two sizes, the standard Echo Express PCIe 2.0 Expansion Chassis with Thunderbolt Ports supports one half-length, double-width, x16 (x4 mode), PCIe 2.0 card, while the XL model supports one full-length card; both models have fans to cool the cards. The standard model includes a built-in 75W power supply, while the XL model includes an integrated 150W power supply with a supplemental 75W PCIe power connector. Two Thunderbolt ports support daisy chaining of up to six devices to a single port on the host computer. Room to Expand—Connect one half-length (full-length in XL model), double-width PCIe 2.0 adapter card to a computer with a Thunderbolt port. High Bandwidth—x16 (x4 mode) 1GB/s PCIe 2.0 slot perfect for special-purpose PCIe cards for video capture, Fibre Channel, 10-Gigabit Ethernet, digital audio, RAID control, multiple screen video, etc. Power for Powerful Cards—Integrated 75W power supply (150W including one supplemental 75W PCIe power connector in XL model). Two Thunderbolt Ports—Daisy chain up to six devices to a single port on the host computer. The Fusion D800TBR5 8-drive RAID 5 desktop storage system featuring Thunderbolt™ technology includes a high-performance internal RAID controller that supports RAID 5 for great performance and file protection in case of a single drive failure, and JBOD for maximum flexibility. Drive configuration is managed through a simple-to-use application. Fusion D800TBR5 delivers fantastic performance, achieving data transfers up to 800 MB/s read and 730 MB/s write. Enhanced with a large cache and latency management technology, this system is fast enough to handle a single stream of uncompressed 10-bit 1080 4:4:4 HD, or multiple streams of ProRes 422, uncompressed 8-bit 1080 HD, DV, HDV, and DVCPRO video. Support daisy chaining of up to six devices to a single port on the host computer. Available in 8, 16, or 24TB configurations, Fusion D800TBR5 is backed by Sonnet’s 5-year pro storage warranty. Brains—Built-in high performance hardware RAID controller supports multiple drive configuration choices. 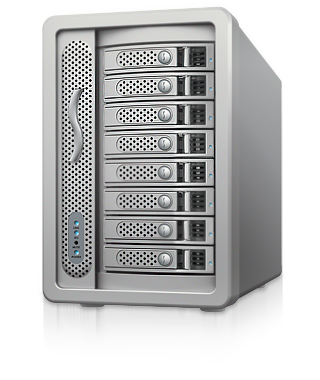 File Protection—RAID 5 drive configuration enables great performance while safeguarding data in case of a single drive failure; RAID levels 0, 1, 6, and JBOD configurations also supported. 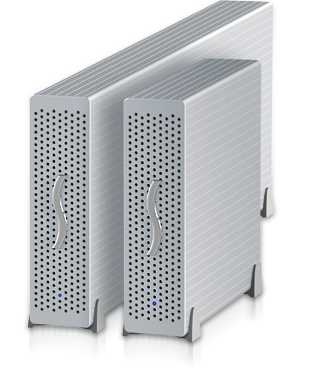 High-Performance—With drives configured as a RAID 5 set, data transfers up to 800 MB/s read, 730 MB/s write. Built for Video Editing—Fusion D800TBR5 is enhanced with a large cache and latency management technology to support uncompressed HD video editing workflows. Pro Storage Warranty—Fusion D800TBR5 is backed by Sonnet’s 5-year pro storage warranty.